Tarleton Harvin Watkins was born in Corpus Christi, Texas, in 1914. He enlisted in the Air Force in June 1938, as an aviation cadet at Kelly Field, Texas. He served in Hawaii and North Africa during World War II, flying more than 120 combat missions as pilot of A-20 and P-40 aircraft. His combat record which accounted for three enemy aircraft destroyed in the air, merited the Distinguished Flying Cross, the Air Medal with seven oak leaf clusters, and the Presidential Citation with oak leaf cluster. His post-war service began with a tour in Bermuda where he served first as deputy commander, then as executive officer for Kindley Air Force Base. In July 1951 he was assigned to Germany as administrative assistant to the commander of the 1602nd Air Transport Wing. On Jan. 1, 1952, he became deputy wing commander, a position he held until August of that year when he was appointed commander of the 1708th Ferrying Group at Kelly Air Force Base, Texas. He was named commander of the 1708th Ferrying Wing at Kelly in October 1955. 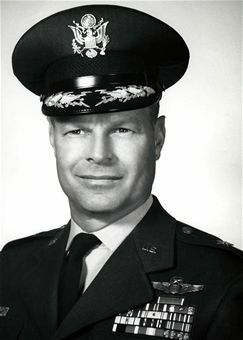 Following a year at the National War College (Fort McNair, Washington, D.C.), General Watkins was named deputy for operations for the 322nd Air Division at Evreux-Fauville Air Base, France, in July 1957, and became deputy commander of that unit in January 1958. He assumed command of the 322nd in June 1959 and held that post until his assignment to Headquarters Ninth Air Force as Deputy for Operations in June 1961. His promotion to brigadier general became effective April 1, 1961. Tarleton “Jack” Watkins’ fascination with flying started when he was a youngster and propelled him to a career in the U.S. Air Force that began at Hickam Field near Pearl Harbor and included flying more than 120 combat missions during World War II. He retired as a Brigadier General in 1967 and eventually settled in San Diego, where he was a consultant with Convair Aircraft. Although he had originally intended to retire to Florida, the Sunshine State’s humidity and San Diego’s pleasant weather spurred him to make the permanent move to California, where he enjoyed many years of playing tennis. General Watkins died of natural causes December 12, 2009, at his home in Redwood Town Court Retirement Village in Escondido. He was 95. General Watkins’ son, Tarleton Harvin Watkins II of Boston, said his father knew at an early age he wanted to become a pilot. He grew up around airplanes because his father was an Army Air Corps Colonel and a former flight instructor who counted a young Charles Lindbergh among his students. General Watkins was born John Tarleton Harvin on December 5, 1914, in Corpus Christi, Texas, to Ruth Woodruff and John Tarleton Harvin. He was 8 when his father died, and his mother later remarried. Her new husband, Colonel Dudley Warren Watkins, adopted her four sons and John Tarleton Harvin became Tarleton Harvin Watkins. He and his brothers grew up in San Antonio, the Philippines and at Wright-Patterson Field in Ohio. He attended the University of Maryland and Texas A&M University and graduated from Army Air Corps flight training at Randolph Air Force Base in Texas in 1939. He was stationed in Hawaii when Pearl Harbor was attacked in 1941 and was among a handful of pilots able to pursue the Japanese attackers. He spent the rest of the war in North Africa. His career included flying every type of aircraft in the Air Force inventory to installations around the world and serving as director of airlift at Tactical Air Command headquarters at Langley Air Force Base in Virginia. General Watkins was chief of staff of the Taiwan Defense Command and was involved in negotiations with China in the late 1960s. General Watkins organized and participated in many senior tennis tournaments in the area and played well into his 80s. “I think he gave it up because he could no longer beat guys in their 50s,” his son said. General Watkins was also active with the Arthritis Foundation of San Diego and the Rancho Bernardo Seven Oaks Community board. In addition to his son, General Watkins is survived by a daughter, Sarah Woodruff Watkins of San Diego; a brother, Dudley Warren Watkins Jr. of Bristow, Virginia; and a grandson. He was predeceased by his wife. General Watkins will be interred in the family plot at Arlington National Cemetery with full military honors in the spring of 2010.